When I started working in pharmacy, this was over 15 years ago. Scholl was the biggest and one of the best brand to buy for your feet. 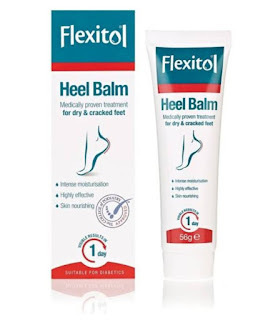 during that time Schools Cracked heel was the most recommended and used by many people. Now lucky we have so many Dupes and cheaper versions that work exactly the same. 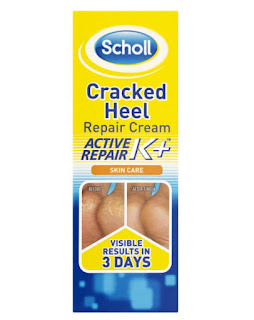 I will give you details of the Scholl cracked heel cream as well as others in the market which is great value yet good for your feet. 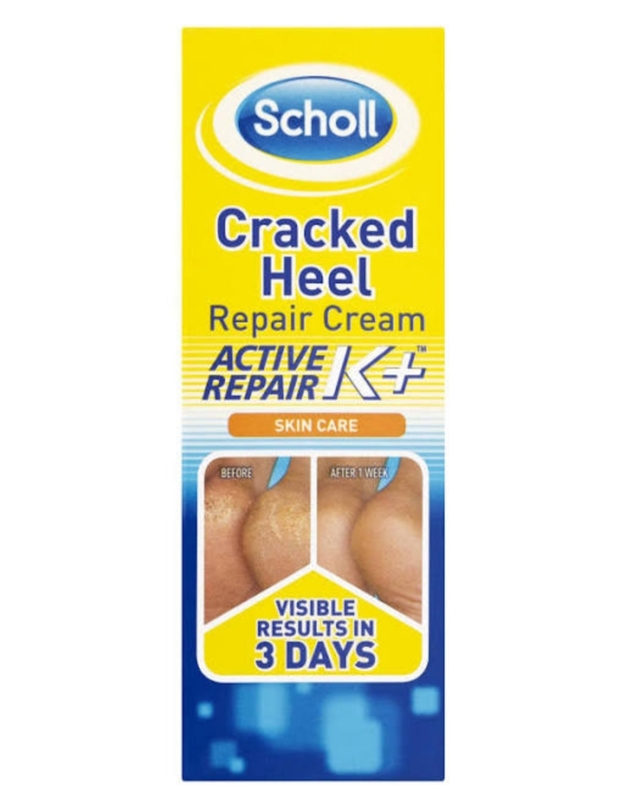 Scholl Cracked Heel Repair Cream Active Repair K+ ™ moisturises the skin and provides 'active' skin repair for rough, dry, cracked heels. It contains keratin, an essential component of skin, to build a natural scaffold to aid skin repair. 85% of people agreed there was a visible improvement in just 3 days. 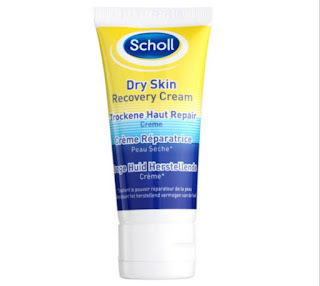 Scholl Dry Skin Instant Recovery Cream makes feet soft and smooth instantly. Contains a deep hydrate formula. If the skin on the feet loses moisture it becomes damaged, rough and flaky - which can look unsightly. Dry skin can feel rough and coarse to touch. 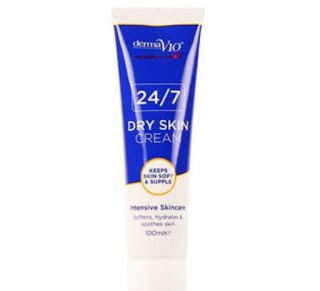 Dry skin Instant Recovery Cream contains innovative Deep hydrate formula which exfoliates dead, dry skin cells, allowing special moisture boosters to penetrate deep into the skin (upper layers of the epidermis) and promote and effective moisture level. The result is instant restoring, gentle softening and smoother looking effect. Long lasting - 24 hour intensive moisturisation. Benefits - Do I have dry skin? If the skin on the feet loses moisture it becomes damaged, rough and flaky - which can look unsightly. Dry skin can feel rough/coarse to touch. 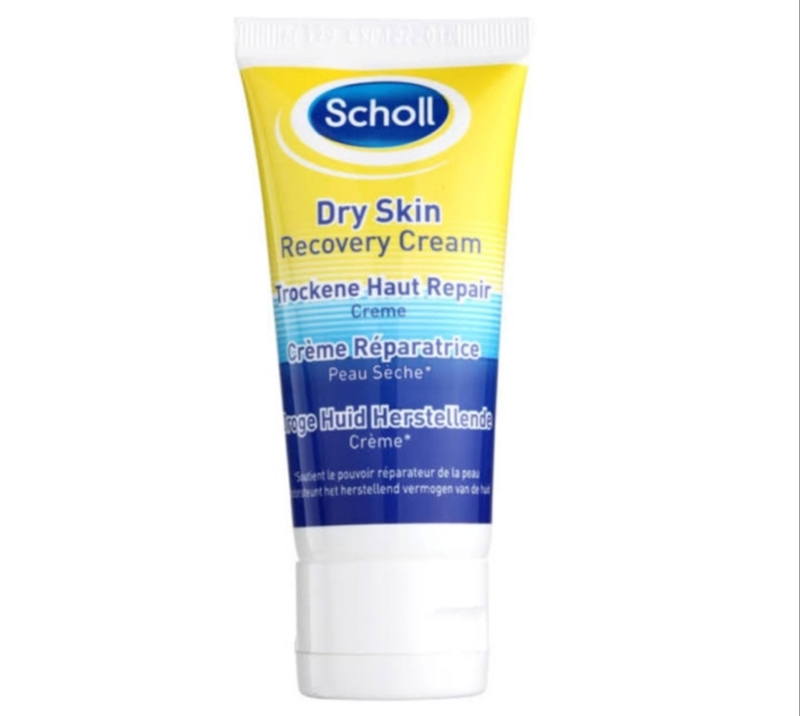 How is Scholl Dry Skin Instant Recovery Cream different? The experts at Scholl have developed a special foot skin care cream - Dry Skin Instant Recovery Cream. It contains innovative Deep Hydrate? formula, which exfoliates dead, dry skin cells, allowing special moisture boosters to penetrate deep into the skin (upper layers of the epidermis) and promote an effective moisture level. The result is an instant restoring, gentle softening and smoother looking effect. Flexitol Heel Balm combines the latest ingredients in skin care clinically proven to have skin nourishing properties. This highly efficacious formulation also contains 25% Urea in addition to active ingredients designed to deeply penetrate into feet for optimal moisturisation and hydration. 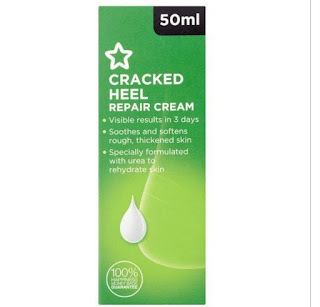 Superdrug Cracked Heel Repair Cream is specially formulated with urea, a highly effective ingredient to rehydrate and help to repair rough, dry and cracked skin, leaving it feeling soft and smooth. The emollient properties of urea help to prevent moisture loss. Visible results in 3 days. 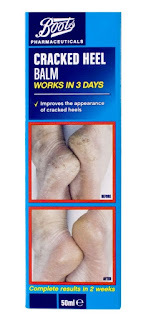 Again this is very similar to school cracked heels as it claims to have results in 3 days. 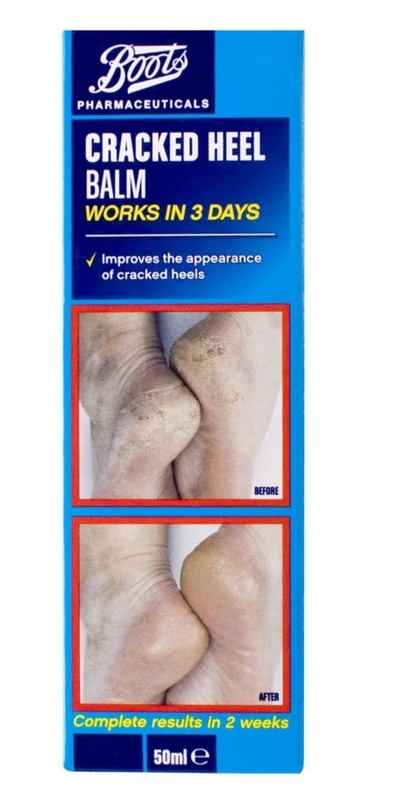 Boots Pharmaceuticals Cracked Heel Balm works in 3 days and improves the appearance of cracked heels. Complete results in 2 weeks. Cracked heels look and feel better after 3 days. The cream contains 25% Urea to help relieve dry skin, leaving feet soft and smooth. Apply twice daily (morning and night) to dry, cracked or rough skin on feet. Rub in and let cream dry. Continue use as necessary once skin's condition is restored. For best results use our buffing block to remove excess thickened skin as part of your daily footcare regime. 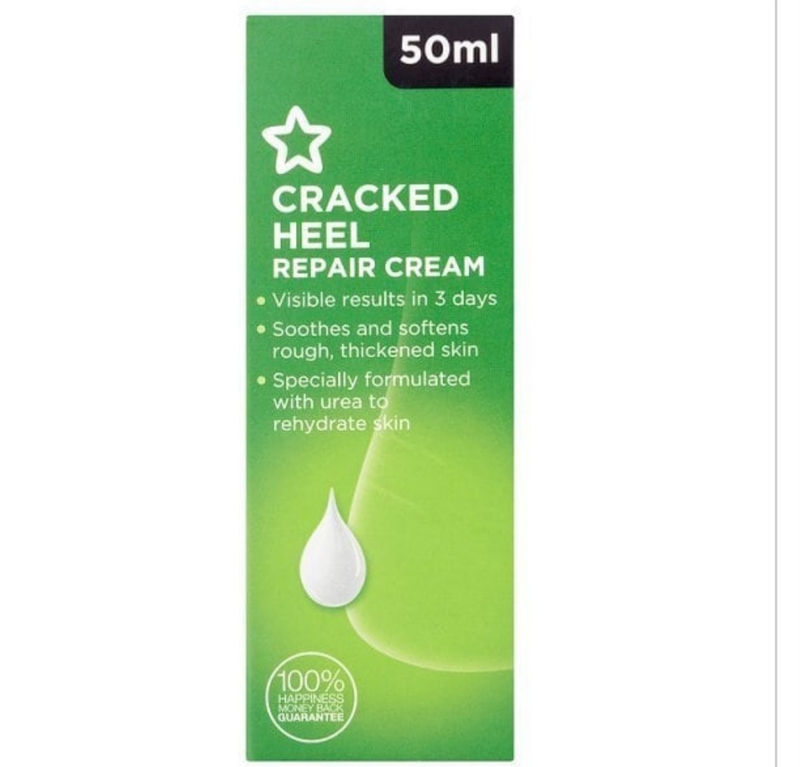 Our rich, moisturising cracked heel cream replenishes and repairs cracked skin. The intensive formula, with 25% urea, effectively nourishes dry areas from the first application. Dermatologically tested, suitable for all skin types. See pack for full ingredients list. Do not use this product if you are allergic to any of the ingredients. Keep out of reach of children. For external use only. Do not use if tube seal is broken or appears damaged. Discontinue use if local irritation occurs during use. Before using this product people with diabetes or circularity disorders should seek medical advice. Contains nut oil. Consult your doctor or pharmacist for advice or more information. Please read instructions carefully before use. For every day use, it helps keep skin soft and supple. Great for sensitive skin to help prevent dryness. Use regularly on hands, face and body, especially after washing or showering. This is not specifically for feet however it can be used to maintain daily care for your feet. Super affordable and works well with any skin type.